Every Tuesday during the season, NHL.com fantasy hockey insider Pete Jensen will provide you with in-depth forward analysis. From updated weekly top 100 rankings to trending players and more, Jensen will be your go-to guy for fantasy forward advice all season long. The Dallas Stars had secondary scoring on their mind when they acquired Jason Spezza, but his early impact has made their primary unit second to none. Eight games into the season, Dallas' top three point-getters (Jamie Benn, Tyler Seguin and Spezza) have combined for 34 points, outperforming elite lines around the League including the likes of Sidney Crosby, Chris Kunitz and Patric Hornqvist (27), Daniel Sedin, Henrik Sedin and Radim Vrbata (31), and "That '70s Line" of Tanner Pearson, Jeff Carter and Tyler Toffoli (33). It hasn't played out the way the Stars (or anyone, for that matter) drew it up, but it's been one of the biggest storylines of the first two-plus weeks of 2014-15. Fantasy owners of one (or more) of these standouts are having a field day. The Stars acquired Spezza, a six-time 60-point producer, with the hope that he could complement the team's top line of Benn and Seguin, which combined for 163 points and finished as the League's second-best point pair to lead Dallas to a berth in the 2014 Stanley Cup Playoffs. They also signed Spezza's second-half linemate from last season, Ales Hemsky, to make sure the veteran felt at home. But through eight games this season, it's been a bumpy ride in terms of line combinations for Dallas. Valeri Nichushkin has been limited to two games because of injury and Hemsky has been a non-factor and demoted to a depth role at times. But Spezza has still made his presence felt, adding even more octane to an already top-heavy forward group. Spezza has activated the Stars' first power-play unit, which has improved its conversion percentage from 15.9 percent (23rd in NHL) last season to 25 percent (T-6th) in 2014-15. Spezza and Seguin have had at least a point on five team power-play goals, which is tied for the most productive duo in the League in those situations with the Crosby-Evgeni Malkin pair of the Pittsburgh Penguins and the Patrick Sharp-Patrick Kane duo of the Chicago Blackhawks. The longtime Senators forward has also made Stars defenseman Trevor Daley relevant in fantasy. Spezza and Daley have combined on three team power-play goals, raising Daley's ownership to 33 percent. In Nichushkin's absence, Dallas coach Lindy Ruff has rolled Benn, Seguin and Spezza together frequently in even-strength situations. There have been 12 four-point games League-wide this season, and the Stars have accounted for three of them (Spezza on Oct. 18, Seguin on Oct. 18, Benn on Oct. 14). So how have the Stars gotten away with putting all their eggs in one basket? The team's underrated line of Cody Eakin, Antoine Roussel and Ryan Garbutt has allowed them to do so by combining for 14 points. The Stars still have their share of questions on the back end and are bound to incorporate Nichushkin upon his return. Even Hemsky, who has fallen off the fantasy grid, still has, at the very least, a few more trials as a top-six forward in Dallas. But for now, the Stars have learned that they have an incredible fallback option. 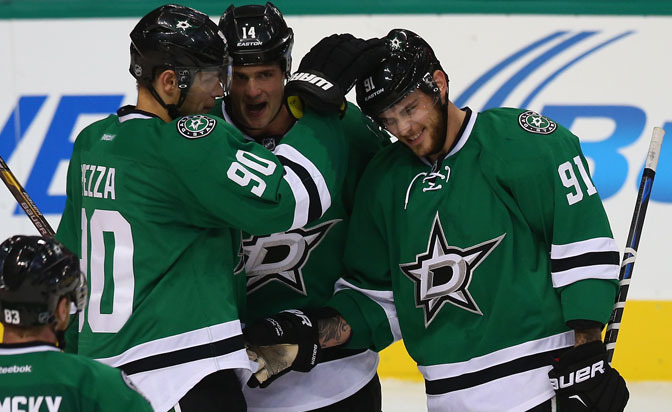 Time will tell if Ruff will go with the Benn-Seguin-Spezza line on a full-time basis, but this trio could be the next big thing on the fantasy landscape. If you want to know about monster trios, Ottawa's unit of Spezza, Daniel Alfredsson and Dany Heatley combined for 296 points in 2005-06. The biggest takeaway from this early-season development is that Dallas has discovered something that they can lean on over the course of the regular season in crunch-time situations, something that few opposing defenses can contain and few fantasy owners can resist. Hartnell is tied for the NHL lead in assists (nine) with Ryan Getzlaf, Daniel Sedin, Jakub Voracek and Spezza. Yes, you read that right. The Columbus Blue Jackets have been ravaged by injuries, most recently ones to Nick Foligno and Cam Atkinson, but their forward depth has held true with Hartnell (10 points in eight games; three power-play points) reeling off a four-game point streak. He's playing with Ryan Johansen at the moment, who's climbing the fantasy ranks himself, so Hartnell has a chance to re-emerge as an elite category-coverage asset if he can hit 50-60 points, 200-plus shots on goal and 75-100 penalty minutes. Judging by his past production in those categories and well-rounded start, the former Philadelphia Flyers forward will have every opportunity to reach those marks with his new team. Kadri, 24, got off to a promising start with two goals in three games, but has fallen back into an offensive abyss over his ensuing five, going pointless with a minus-2 and 11 shots on goal over that span. He is seeing more power-play time per game (2:45) than he did last season (2:22, 18 PPP), but has yet to record a point with the man advantage in 2014-15. He has logged fewer than 15 minutes in three of his first eight games and has dropped out of my top 100 forward rankings. The Maple Leafs reportedly tinkered with their lines at practice Monday, with Kadri and slumping wing Joffrey Lupul joining Phil Kessel on the team's top unit. But while this provides a glimmer of hope for his fantasy owners, it remains to be seen if such a formation has any staying power. Strome's long-awaited fantasy sleeper potential is finally starting to come into fruition. The Islanders are averaging 3.88 goals per game (1st in NHL) and are rolling three formidable lines with the return of Mikhail Grabovski. Strome is currently skating with fellow young players Brock Nelson and recent call-up Anders Lee and has remained a fixture among the team's top six forwards early on this season. The 21-year-old has yet to score a goal this season on 17 shots through eight games, but he has a plus-4 rating and seven assists. He's getting a taste of power-play time (1:47 per game) yet is 10 percent owned in Yahoo leagues. If you're in a deep format, make sure to pick up Strome, who provides roster flexibility (C/RW) after Yahoo's latest position eligibility update. These rankings are based on expectations for the season ahead. Value is quantified by line combinations, overall upside and past performance in standard Yahoo categories (goals, assists, plus-minus, penalty minutes, power-play points and shots on goal).